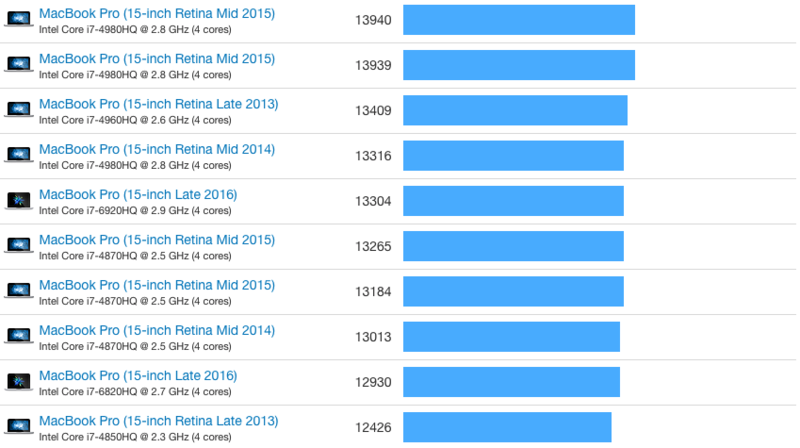 Geekbench: MacBook Pro Late 2016 Slower Than 2015 Model! Early benchmark scores for the new 2016 MacBook are beginning to surface online. It seems as though the MacBook Pro Late 2016 is slower than the older generations. But, these are early results which may not accurately reflect the performance of Apple’s new line-up. YouTubers have also been posting videos running demanding tasks on machines side-by-side. The most popular comparison seems to be a MacBook Pro 2015 i7 with 16GB of memory vs a MacBook Pro 2016 i7 with 16GB of memory. A significant majority of these videos show the 2015 model outpacing the newer TouchBar model unveiled a month ago. 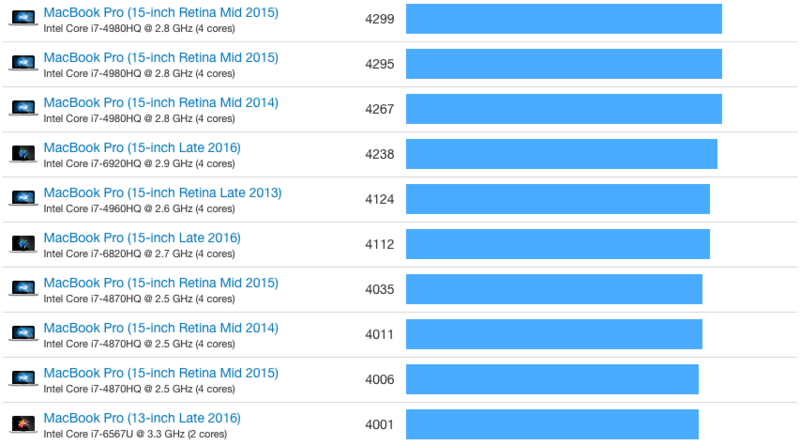 The single core results have the 15-inch retina MacBook Pro 2015 leading the way with just under 4300 Geekbench points. This particular model features the maxed out 16GB of memory and a high-speed m2 SSD hard-drive as well as the 2.8GHz Intel Core i7 4980HQ processing chip. The HQ in the processor’s model name tells us that this processor is built with high-performance graphics and features 4 cores (quad core). Since Apple’s hardware is so tightly integrated with the software I tried to force the argument that the high-end MacBook would perform better when all four processor cores were in use. After-all, macOS is sold as a highly-optimised operating system designed to squeeze every last drop of power out of your machine for the perfect computing experience. I’m afraid you will be disappointed again. If you came here looking for some high-performance multi-core drama, you’ve come to the wrong place. Even activating all available processor cores during the benchmarking tests didn’t do Apple’s new flagship model any favours. The line-up doesn’t change much from single-core to multi-core, with the exception that the 13-inch model drops out of the list. The benchmark results show that the Quad-core Intel Core i7 6820HQ 2.9GHz mean-machine is yet again beaten by the 2015 model. Infact, the latest version of tests we obtained show it beaten by older machines too – but at this point I would like to re-iterate that this may be down to the small sample of 2016 models benchmarked so far. In addition, the difference is only 600 points which shows approximately a five per-cent reduction in benchmarking-quantifiable results. Some would argue that its barely noticeable. After the disappointing keynote unveiling the new flagship machine, followed by poor initial benchmark scores, Apple fanboys must feel hard done. Though the 2016 benchmarking scores are still preliminary and may change once the testing sample grows, it is still a bad start from a line-up that may be past its best days. Benchmark results do not turn on their head, but there will be many out there hoping that they have not overpaid for their £1449 machine.